Comfort cooking and gardening never fail to cheer up a grey day. Spring is peeping out from behind the curtain but thoughts of summer are on my mind today. 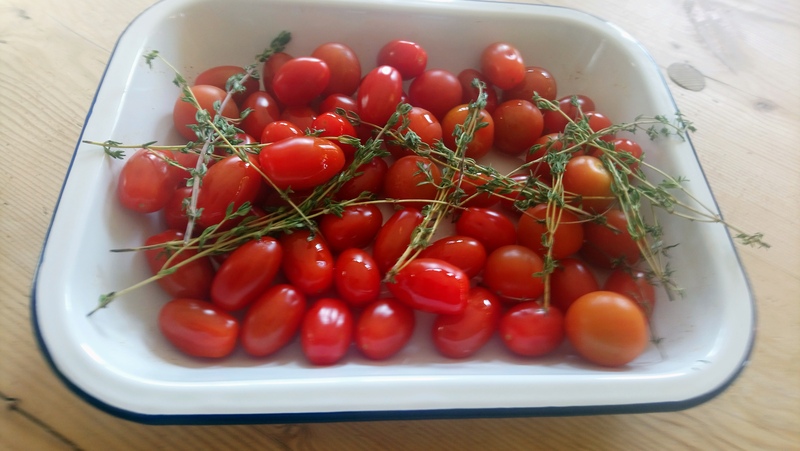 Lunch was a thyme-roasted tomato soup – lighter than the hearty tomato, red pepper, chilli and butternut squash one we tucked into at the weekend. I sweated down a red onion and a couple of fat garlic cloves in olive oil, added the roast toms, a glug of passata and seasoning and blitzed it with a swirl of cream. Simples. A quick jaunt to see my mate Tim at Bradfords to put the world to rights and order the annual bulk bag of compost; an hour in the (pretty bracing) fresh air pulling up the weeds which have germinated since the snow. Both set me up nicely …….and informed me that my knees are not what they once were. 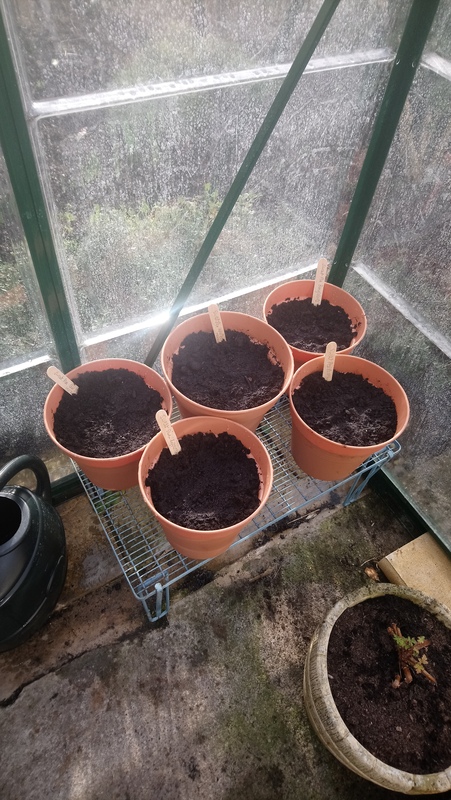 The sun put in a brief appearance so I sowed a few pots of sweet peas to stash in the greenhouse (held together with gaffer tape, since the great hurricane of early February). Wonder how long I can resist the urge to sow in earnest? I’ve abandoned root trainers for sweet peas. They cost a fortune and take up too much space in the shed, which has become a road cyclist’s pit station. About ten seeds in a deep pot does the trick for me now This year I’ve sowed Wuthering Heights, Beaujolais, Our Harry, Kippen Cream and Nimbus. 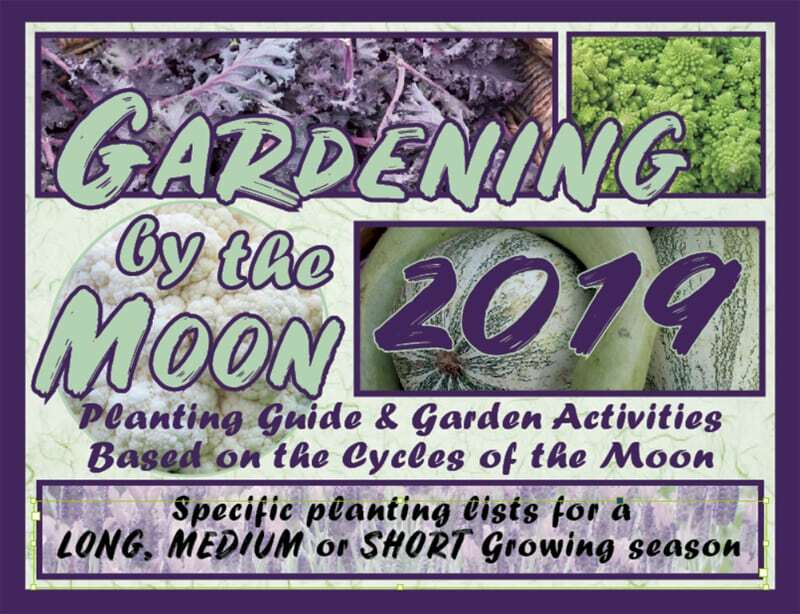 I sow enough for the half an acre plot of my dreams – just in case my ship comes in but what I can’t plant will head to the school flower patch where I’m on a mission to spread the gardening love. Not a bad way to waste a few hours of your school hols. Now where’s the ibuprofen gel? If you want to change the world, it starts with your next thought. Several years ago, when I was developing an outdoor education programme for primary schools, I signed up for a permaculture design course. I endured the inevitable jokes from family and friends about knitting my own sandals out of lentils but it didn’t take me (or them) long to realise that what had started as a way of making school growing spaces sustainable and productive, in fact, was going to change my approach to more than just gardening. Permaculture design has the power to reframe how we see the world. It is truly transformational. Holistic, solutions-focused, creative and with a firm belief in the power of making connections and working cooperatively, it has much to offer the classroom teacher, school manager and student. As a teacher I try to employ permaculture principles in everything from classroom management to curriculum design. Nevertheless in the cut and thrust of daily life in the classroom with its focus on an increasingly heavy knowledge-based curriculum, assessment objectives and target grades, it’s sometimes difficult to get beyond a ‘design’ and ‘do’ approach to solving problems. The school holidays provide the time and space for the reflection, thinking, researching and redesigning necessary to do the best job possible in the classroom. 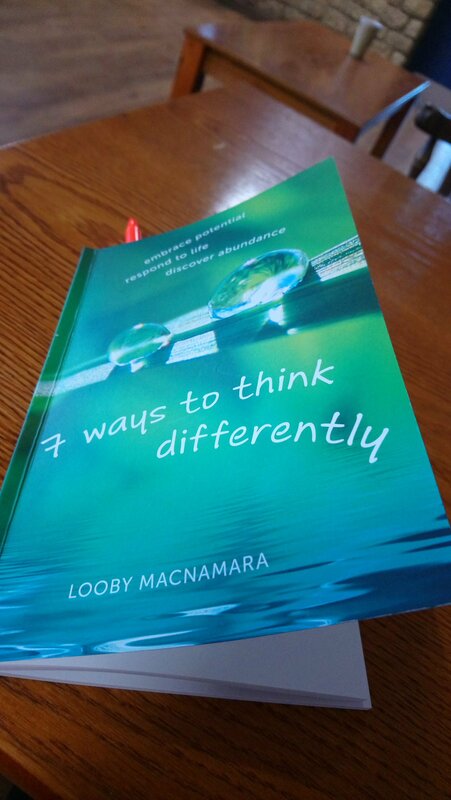 This afternoon, while my daughter spent a few hours running around a rugby pitch training for the next Dorset and Wilts game I read Looby Macnamara’s accessible book on creative thinking, permaculture-style. Much of the advice I already knew but a gentle reminder about what’s important is vital when you’re reflecting back over the last six weeks and deciding upon your approach to the second half of term, especially with GCSE and A level classes. It’s a good read. I have highlighted below my top ten pieces of advice from Looby, which any teacher or student might find useful. They are in no particular order but all are part of my approach to teaching and learning. Celebrate what you have done, rather than focusing on what you have left to achieve. Glass half full, in other words. A positive attitude can keep you afloat even when your workload seeks to drown you. Talk and respond to each other in nurturing, kind ways. Kindness is monumentally underestimated. Try it. You’ll be surprised not only how good it makes you feel but how much more productive it makes you and those around you. Think in terms of ‘responsibility’ not ‘blame’ and ‘contribution’ not ‘gain’. We live in a fractured society where who is to blame and what we can gain seems king. A classroom where everyone is encouraged to take responsibility for their actions and make a contribution, where blame is not the culture and competition is second to cooperation is a happy and productive place. A microcosm for society I hope. Identify the outcomes you hope for; then actively seek ways to bring them about. Every journey starts with a single step. It’s not rocket science. Working backwards from the end point allows students to plot a course through the most demanding times in their school careers – public examinations. Often they will visualise a worst case scenario and how they got there so that behaviours can change before it is too late. Foster beneficial working relationships; build a sense of community; align yourself with like-minded people. Think beehive or ants and what they manage to achieve together. It’s powerful. Harness the natural ebbs and flows of energy of yourself and others. There are times in the day and times in the week when I feel more or less energetic. It’s a waste of time marking at midnight, for instance. Saturday morning lessons with my students are not the times to introduce new concepts. Experience has taught me to schedule work according to energy levels. There is no point fighting this. I work with it. Take time to be still and reflective. All the better if this also involves a walk in the fresh air. Creativity can only happen when you have time to do nothing. And I mean nothing. No phones or tablets. We would all be wise to heed this mantra. Live in the present but think for the future. Does what it says on the tin. Live every day as if it is your last, but bear in mind it probably won’t be and act accordingly. Seek ways of moving from your comfort zone into your stretch zone. Solutions come through movement. If water doesn’t move, it becomes stagnant. And so do we. Be prepared to take some risks. Students and certainly parents in general seem more risk-averse than they did when I started my teaching career in the 1990s. This is not a good thing. A diversity of interests, skills and opinions brings about the best solutions. This is true for individuals and groups. Harness the power of teams of individuals with different skills. Encourage students to use skills developed in other subject areas in your own classroom. 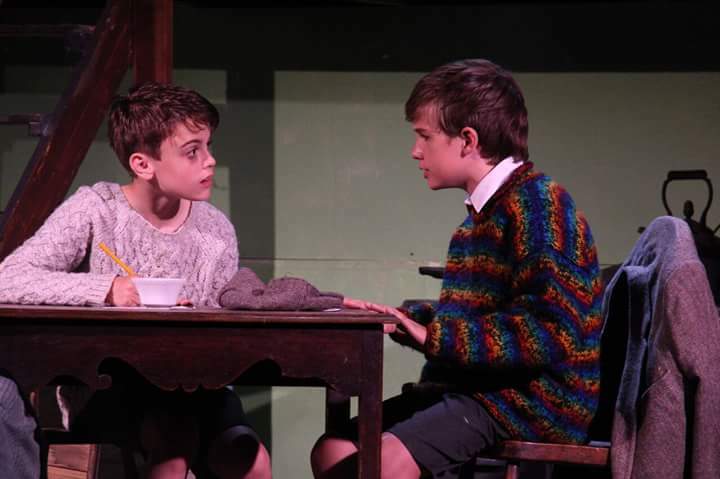 My love of gardening and cooking has taught me much about being a good parent; directing large-scale theatrical productions has improved my ability to lead whole-school initiatives and deliver them on time and under-budget. Judging by the amount of tweets from teachers over the weekend, I’m not the only one taking time to review my classroom practice and think creatively in the down time of Half Term. It’s what school holidays are for – along with cooking, sowing a few seeds, reading and spending time chilling with my own children. 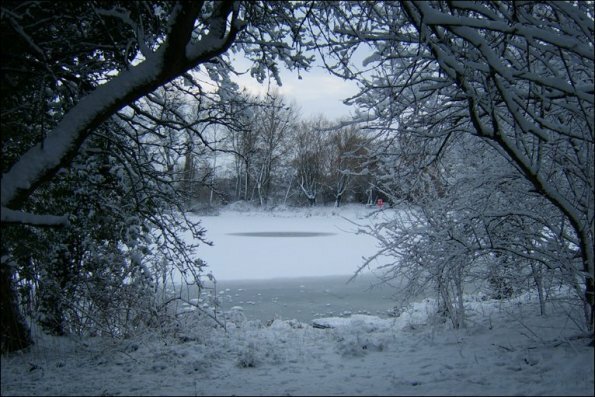 Waking up to a snow day to herald in Imbolc, the start of Celtic spring has reminded me that I’ve been keeping this blog for ten years exactly. At that time my youngest child was in Reception class; now my eldest is in his final year at school. Seminal years filled with happiness, tears, beginnings and endings, adventures, familiar places, old friends, new friends, and embracing life. Much of this is documented in this blog. Imbolc is one of the fire festivals and so it’s right that we will be huddling around the fire this evening to keep warm and spend time together. There may be rugby six nations action too. Imbolc and the feast of St Brigid isalso traditionally a time of visiting wells, spring cleaning the house and preparing to sow the seeds of the next harvest. That will have to wait until Half Term, although I may order a load of mulch to spread over the garden plot when the ground thaws. All teachers are actors, right? We’ve had a theatre company in school today and the whole experience was energising for me and my students. Above all it made me reflect on how much of a kick I get out of acting and of working with a group of friends and strangers who become friends on a creative project. There’s fun and camaraderie to be had, skills to develop and a sense of a achievement in putting on a performance which brings joy to so many people. I even enjoy the inevitable stresses which come with working under pressure. As my students (and my own children) approach the final leg of exam courses it seems vital to me that they continue to pursue creative and sporting endeavours alongside their studies. Balance is all for a healthy and fulfilling life. We’re almost at the end of January and, unsurprisingly I haven’t managed to get outside for a walk every day since the start of term. In fact, I haven’t had a day free of schoolwork either and I am losing my battle with psoriasis – always a ‘thing’ in January with its lack of sunlight. Somehow a quick turn around the garden and sorting my seeds ready for sowing is a poor substitute for getting some dirt under my fingernails and the elements on my face. At times like these you have to seize what crumbs of hygge you can. Our teenagers are slow to rise on Sundays when there are no morning sports fixtures. Some want breakfast; others don’t. The whole day can have a disparate feel which throws me out of kilter. So yesterday, with the ironing finished and a glut of milk in the fridge I made pancakes. 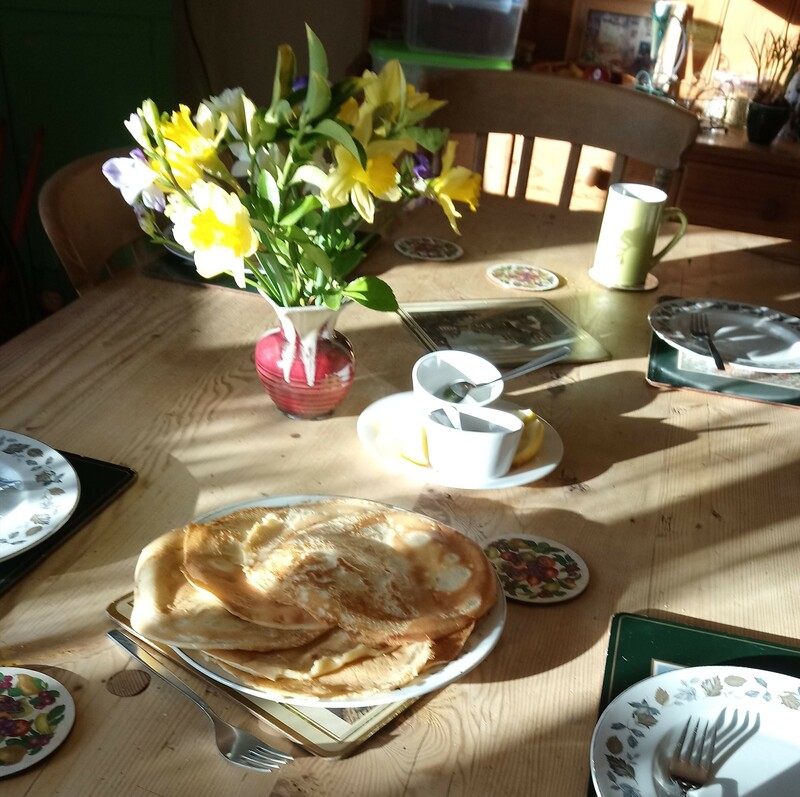 Everyone appeared around the table – even the son who didn’t want to eat – and we spent half an hour having a chat over coffee and lemony pancakes. I don’t want anything fancy in January. And the sun popped out from behind the clouds for a short while and bathed the table in dappled sunshine. 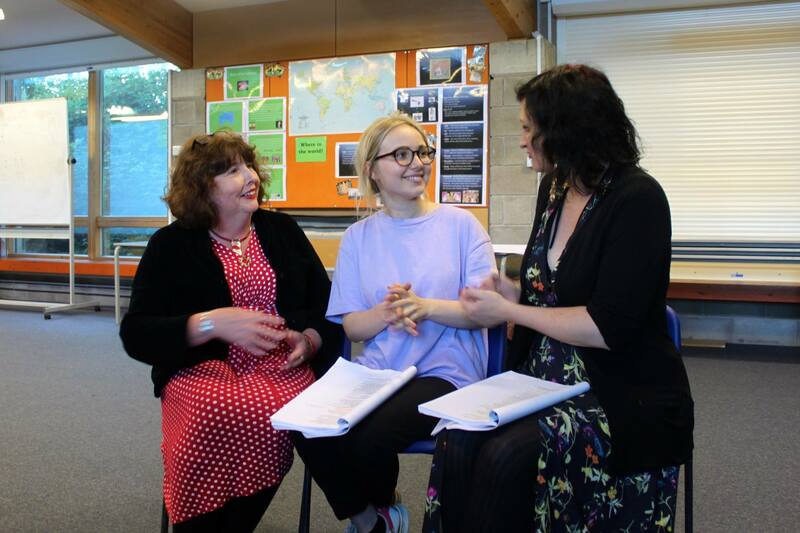 There’s never enough time to fit in much in the way of theatrical productions in the first term of the school year; but round about now it’s time to start thinking of next summer’s large-scale production at the 14th century Tithe Barn in the middle of town. 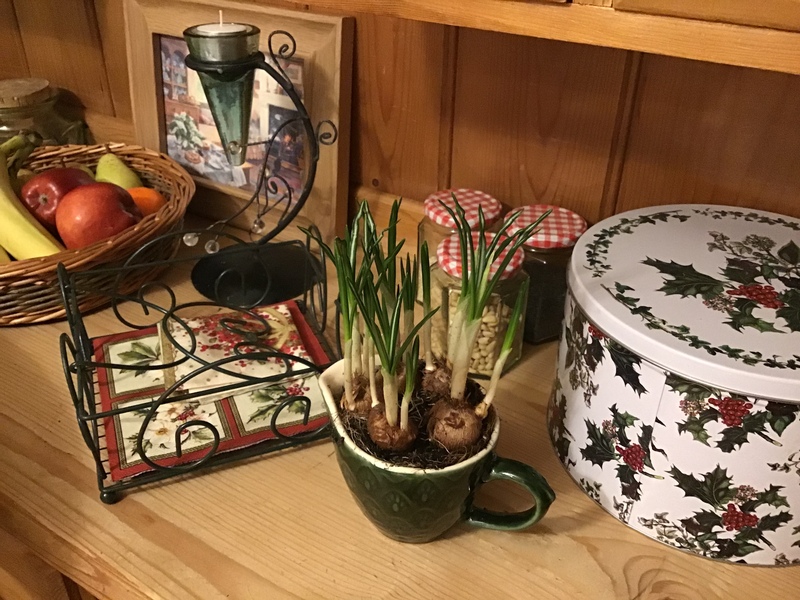 It’s my way of escaping the greyness of January – along with preparing to sow seeds when the weather warms up and the odd jug of indoor bulbs like these crocuses. 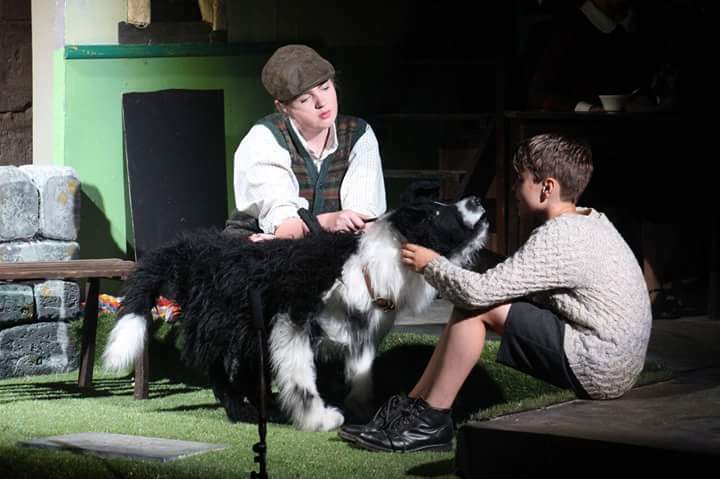 The first week of my school holidays last summer was production week for ‘Goodnight Mister Tom’, one of my favourite stories and a project that has been part of my life for a long-time as I waited for the script to be written, published and available for license. 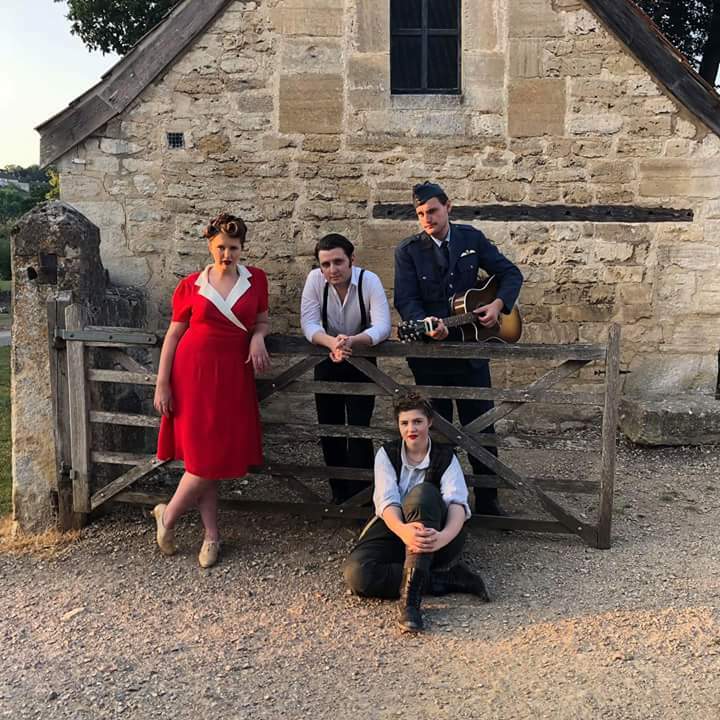 We played to packed and appreciative houses over five nights in the Tithe Barn in the midst of a heatwave. 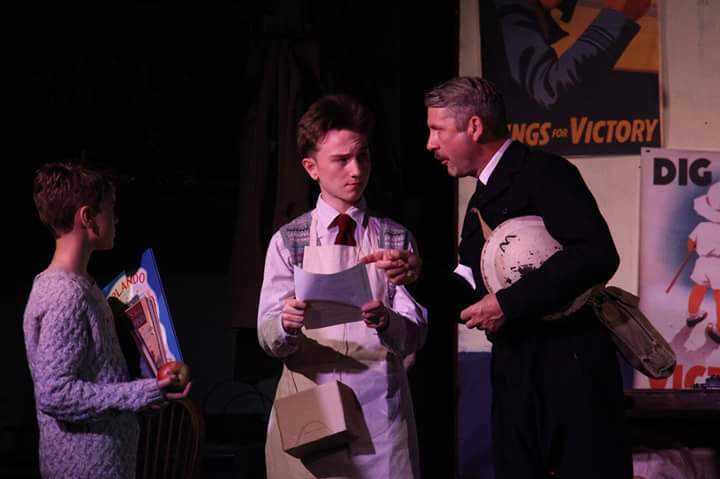 It was a huge team effort, as indeed is every Bradfordians’ production and a great way to begin the summer holidays. 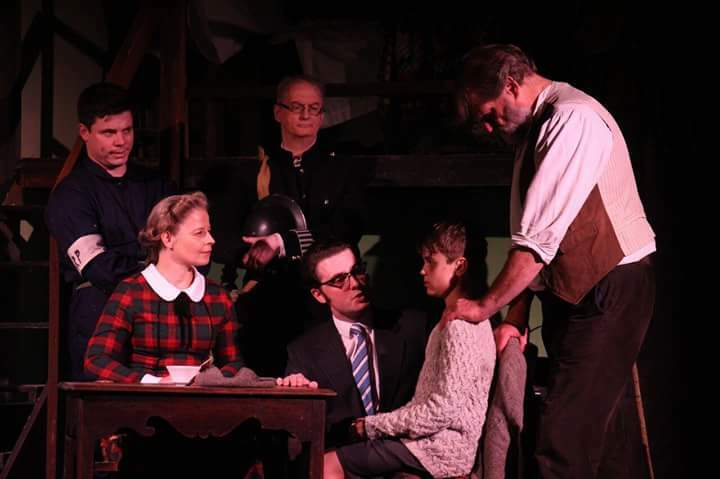 This week we heard that we have been nominated for two more awards for local theatre – best Dramatic Production and Best Company Crafted Production, which delights me no end because it rewards every single person involved in the show – and this truly was an ensemble piece. A bit of drama is good for you, a real hygge experience, as I’ve written before. 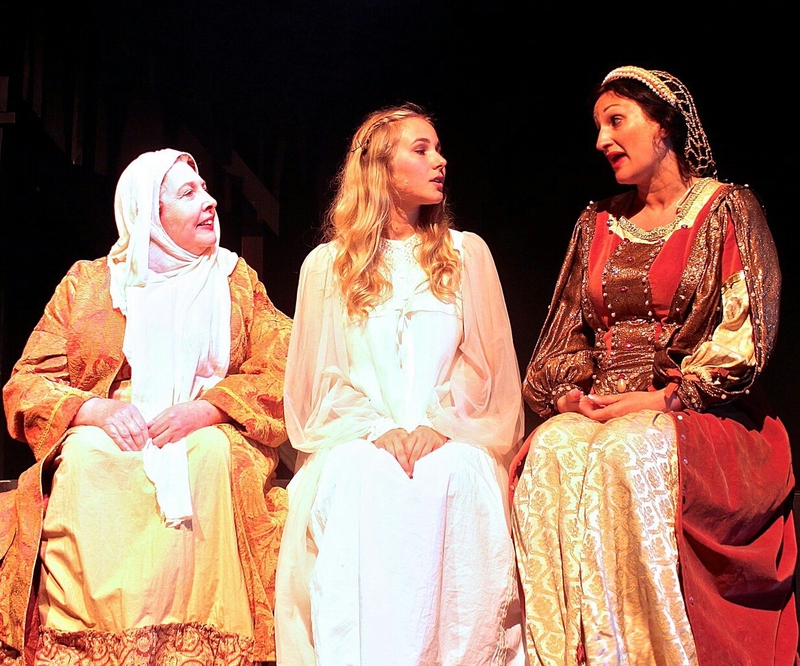 And so I was overjoyed when the script for this year’s production Tess of the Durbevilles landed in my in box for perusal, prior to auditions in March. It has the director Phil Courage’s signature jaw-droppingly visually powerful final scene and I for one can’t wait to get involved. While living in the moment is to be recommended above all else, having something to look forward to is good too. On some days of the week I get into work early leaving my husband to sort out packed lunches, breakfast and setting our teenagers off to school. On these occasions I have time to sit and think before the business of the day gets underway. Printing materials for class, last minute marking feedback and the listening to teenage angst are put aside. School days are packed with conversations and I crave the silence of an empty classroom to centre me in preparation for these – space to slow down and relax a bit. A five-minute morning meditation is a simple, easy ritual that can have tons of benefits. Taking time to focus entirely on the present is easy enough in the holidays but once term is underway it becomes more difficult but more necessary. Establishing a routine is vital. I brew a pot of coffee and carry it up to my classroom with my favourite mug to begin. I’m lucky in that my room looks out on the science department garden and greenhouse but I keep my focus on the jam jar of fresh seasonal flowers that always sits on my desk. 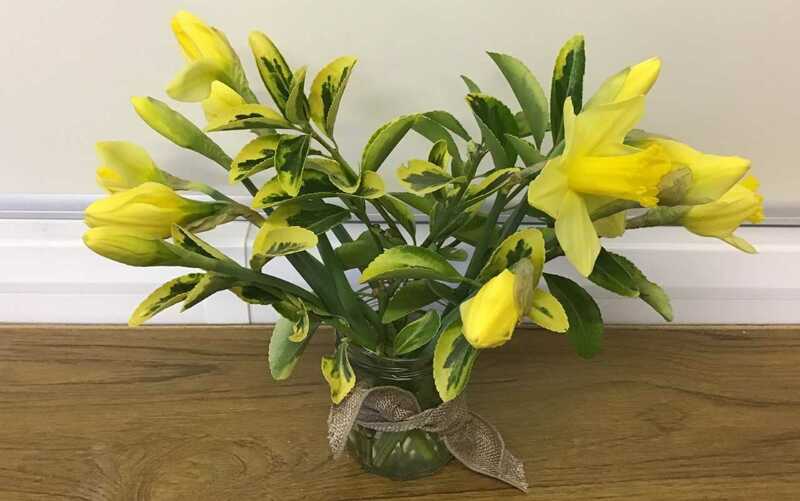 I like the changing of the seasons reflected in my flower choices. Most are home-grown. It’s no surprise that I was a regular contributor to the nature table when I was a school pupil. Then, whilst seated in my chair it’s all about controlling my breathing and gently letting all the thoughts that flood my mind float away as and when they appear. It takes about three weeks of determined effort to establish a routine and then it becomes second nature. I highly recommend it for both teachers and students whose minds are constantly at work. Of course it takes time to train your mind to be in the present. Silence can be a scary place for teenagers, but great things can happen in the silence.